Yep, right here, this is the one. The lady sitting behind us on the long-distance bus reached over the seats and tapped my shoulder. “Are you going to Jingxi for fun?” Our bus had just made a mid-journey rest stop and we were boarding again after the passengers had all had a chance to use the bathroom, smoke a quick cigarette, or buy snacks like tea eggs and corn on the cob. This fellow passenger had just gotten back to her seat, but remained standing so she could strike up a conversation with the laowai. Immediately, my brain calculated: is it worth telling our whole situation to this lady? We get asked gazillions of questions by perfect strangers all the time. Sometimes, it’s easier to give a short but not-entirely-truthful answer, rather than our actual circumstances. Our lives are confusing enough to explain in our native language to our fellow Americans back home, let alone to folks who have never even left their own province. “Yes, we’re going to Jingxi,” I answered vaguely, buying time by not answering the last part of her question. “Are you going there as tourists?” she pressed. “You LIVE there? But I’m from Jingxi, and I’ve never seen you there before.” This goes to show just what a small place Jingxi is. This lady assumed that if there were white foreigners in her town, she surely would have heard about it, and would probably have seen us around town. “Well, we just moved there,” I offered, not really wanting to explain the full, complicated version that includes past trips to Jingxi to visit, and short-term periods of living there over the course of several years. My mind hesitated and calculated again. By now, the passengers around us were all listening to our conversation with interest, and I dislike revealing too much personal information in public. Even if this lady seemed nice and friendly, I couldn’t guarantee that everyone in hearing range was, too. I decided to just tell her anyway, but then realized something crazy: I don’t know the name of the street we live on. I know the name of the major road it’s just off of, but I don’t know (and possibly never knew?) the name of the actual street. Just knowing the name of the apartment complex has always been enough, even for getting mail. “I don’t really know which street,” I answered honestly. I started to explain, and was planning to give the name of the complex, but for whatever reason, my answer satisfied her and she sat down without another word. Perhaps I had stumbled upon the polite way of saying, “I don’t really want to share that information.” Or maybe she was just afraid of falling over as our bus lurched along on the bumpy mountain road. I reflected that I had somehow managed to be fairly polite and basically honest, but had not given out our exact location. I had accomplished my goal of discretion, even if I still wasn’t quite sure how I had accomplished it. But that was all in vain, as I was about to find out. We arrived in Jingxi, poured off the bus with everyone else, dragged our luggage through the station, across the plaza and onto a waiting sanlunche. On the ride home, the driver stopped for a red light, and a scooter pulled up next to us. The scooter folks started talking to our driver and asked where she was taking the foreigners. “Xingfu Huayuan,” she answered, giving them the name of our apartment complex without batting an eye. So much for not giving out personal information to total strangers. The driver dropped us off at the front gate of our apartment complex, and we walked in. We were greeted by a chorus of “waiguoren!” shouts. A group of boys were playing in the newly-filled fountains in the central plaza. As we passed them on our way to our building, they continued talking about the waiguoren, and eventually their ringleader decided they should follow us. So, there we were, approaching our staircase, with a gaggle of boys close behind. 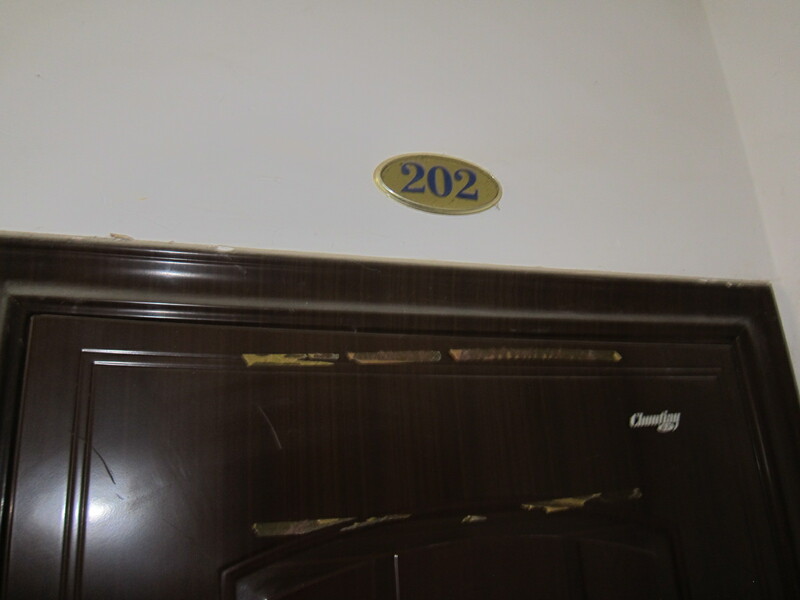 “Right up there, in apartment 202, that’s where the foreigners live!” the ringleader announced to the others. Yes, indeed. That is exactly where we live. Sigh. So, yeah. There’s probably no reason to try to keep our exact living location secret. Because really, despite the new high-rise hotels and the advent of taxis and the influx of people from Guangdong and Sichuan, Jingxi is still a small town. That lady on the bus is probably the distant relation of our sanlunche driver, and the little boy in our apartment complex is her cousin-on-her-mother’s-side’s grandson. Most likely, the reason she stopped asking me was because she figured it would be easier to just ask around to find out where we live. After all, everyone in town knows. Though we are in a big city with a good number of foreigners, we still hear the “waiguoren” thing a good deal. (mostly from children) A neighbor in our apartment complex asked which danyuan we lived in so I told her our apt number. She thought for a moment and then the light of recognition lit up her face when she said, “Oh yes! Your’s is the place with all the laundry! Now I understand why, because you are foreigners!” Ha ha! It is so true…we hang out two full racks of clothes every time we wash clothes, probably 20 articles of clothing. Most Chinese balconies have about 3-7 pieces of laundry at any given time. Ha, ha! Even your laundry gives you away, so there’s really no hiding. We hear “waiguoren” and “meiguoren” from kids, “laowai” from grown-ups, and just get long, silent, blank stares from the elderly.